My name is Sally Westwood and I am a genealogist and family historian. I have been interested in Family History ever since I used to listen to my grandad's stories as a child. He would tell us about walking the line as a ganger on the railway, and about working on the farm before and during the Second World War. I went to one of the Cambridge museums see the ploughed-up Roman Tombstone he had found and, of course, like any child, hung on every word as hideous accidents were described. Most of all, though, I loved to hear about his family history. He said that his father's family had "owned half of Norfolk" and that his mother was "one of the Fair People" - a fortune-teller, no less! Well, no... But finding that out has led me into my family tree and to many equally interesting stories which were true. 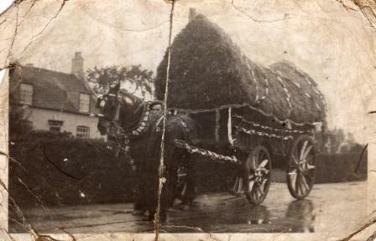 My grandad, Robert Riches, was a farm foreman in the 1930s. His first love was the heavy horses. 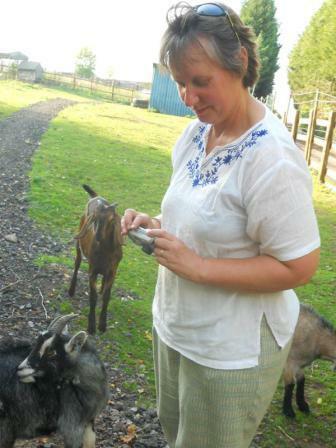 This is me, attempting to photograph goats. Feeding them is easier. I've noticed that lots of my ancestors' photographs include animals, too. At University (London) I gained BA Hons in English Literature, specialising in the Historical papers - Anglo-Saxon, Chaucer and his Contemporaries, Shakespeare, The 17th century etc. Later, as part of the Richard III Society's Wills Project, I was lucky enough to study "Secretary Hand" with Dr Rosemary Horrox of Oxford University. I have transcribed several Parish Registers and Non-Conformist Registers for Cambridgeshire Family History Society. I am a member of APG (the Association of Professional Genealogists) and SoG (the Society of Genealogists). For 26 years I worked as a teacher. I live on a narrow boat with my husband, Kevin, 2 dogs, Brindley and Paxton, and four cats, Lily, Twig, Henry Tadpole and Mrs Myrtle Brown. If you notice any family likenesses in the photographs on this site, it's not surprising as they are all my own ancestors, discovered whilst researching my family tree.